Hi Everyone, Just a small up-date on the first 50" F/3.5 Fullum Folded Newtonien. 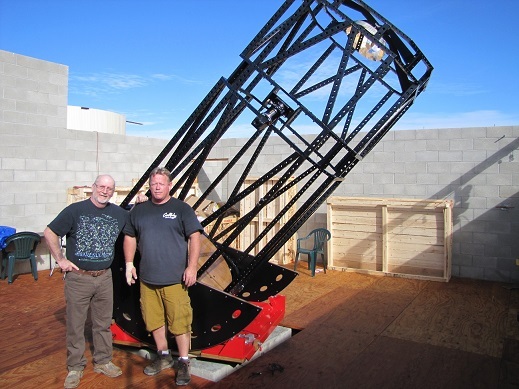 The telescope is now installed in California and working under DARC Sky. This telescope is equiped with my own Techno-Fusion primary mirror build to be very light and fast cooling. The EP is at 8.5' only versus a regular dobsonian that would be at 16' !! The Folded design make it very safe for you or the public to observe the night sky. 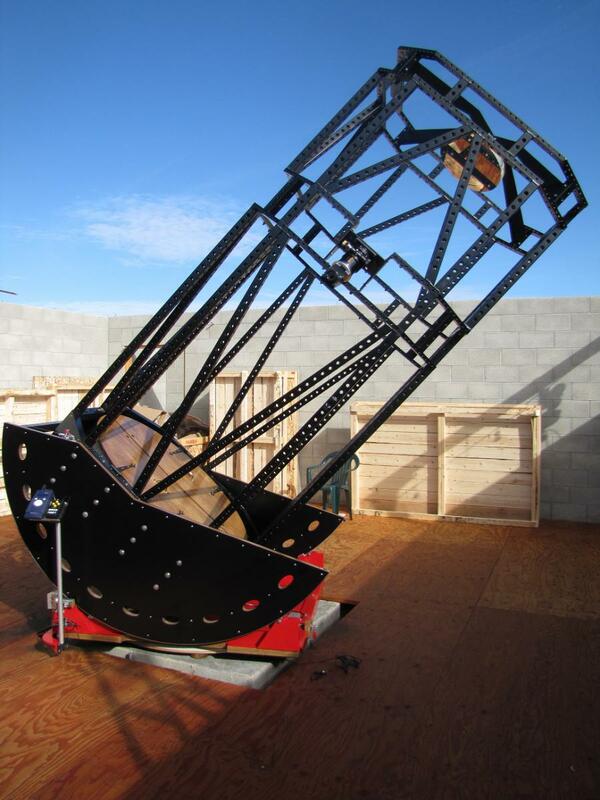 If you would like to see and try this telescope, just let me know and I can arrange a visit at this private observatory located near San Jose. If you would like more infos on this type of telescope, please do not hesitate to call me at 514-967-1909. Edited by Astronorm, 03 December 2014 - 08:33 AM. Well done, sir. A maximal minimalist design! Norman, You pulled it off! Big time congratulations. The bar has been raised yet again for large Newtonians. Hope to someday look through that jewel. The folded design sure makes a lot of sense. Bob S.
If I didn't live 3000 miles away, I'd be there. Excellent. Maybe you should write it up for a magazine. How is the optical quality? What exactly is a techno-fusion mirror? The Techno-Fusion is a new Lightweight and fast Cooling type of mirror that I developed at my shop for very large mirrors, I can send pictures directly to you if you want. Could you post them in the Vendor forum? Done, you can see them on the Vendor Forum. It's pretty amazing, Normand. From the mirror blank to the telescope design and structure, you've covered it all. What can't you do, may be an easier question. Funny you showed up, Howie. I was just wondering if he'd have to use a pipe wrench to collimate something that big! The weight of the mirror must be substantial. At the SkyWatcher booth at NEAF, I think it was, I saw a dob of around 22 inches which had a mirror that looked similar. Is it the same process? Something has to be done about the glass for these big mirrors. I have been counseling a friend who has had issues with a large Pyrex blank which was made about ten years ago. Every time he gets the figure about right, he gets astigmatism. He fixes that, and then must work the curve. Then the astigmatism comes back. It seems to be due do the Pyrex lacking homogeneity or possibly due to a bad annealing. 1. Why go through the trouble of a fast cooling lightweight mirror if that behemouth is in a set observatory that is always at ambient temp? 2. So I am looking at the folded design. Great setup. there is obviously a larger secondary at an acute angle thereby increasing central obstruction. What % of light is lost vs. an optimal standard NEWT setup? Does it take the 50" light bucket down to say a 48" effective bucket? Edited by woodscavenger, 03 December 2014 - 06:50 PM. I have been looking at the picture you show of the 50". I am wondering how you came up with the materials list for the truss system? How is the rigidity of the materials you employed to hold that large secondary mirror and transfer mirror (lack of a better term for the folded mirror design)? Have you been experiencing some challenges with collimation as the scope is moved from horizontal to zenith and then back to horizontal especially considering that you are using a folded design? Approximately how much would a laser dot placed in the focuser move on the primary center spot when moving the scope through it available arc? Bob S.
The rigidity of the truss is extreme. I use 2"x 2" x 3/16" aluminum and it's all bolted together with 3/8" Stainless bolts. The secondary mirror is a lightweight Cellular that is glued with silicone on a 3/8/ aluminum plate that cover 75% of the back. The laser dot doesn't move when the scope is from zenith to horizon. It was my main concern after taking care of the primary mirror cell and edge support, I made sure of that. The third mirror is in the diagonal just like any 90 degree or 45 degree diagonal with mirror, the angle is different and the shape of that small mirror is different and it is attached to the focuser but otherwise is the same principal. I wasn't restrained by the weight of the structure when I build that telescope design, those scopes are not meant to be moved, they are for a stationary observatory. The 50" weight 1500 lbs total. If you compare with a normal 1.2 meter telescope made for research with a solid mirror, just the primary mirror is twice that weight!!. Normand, what is the size of the flat/thickness.Did you do the optical fab on it.Zerodur or some other ule materiel? merci, kim jenner Ashcroft,B.C. The Flat is a ellipse of 19" x 21" made of borosilicate 33 and it is cellular for it's lightweight property. I had a special visitor at my Observatory!